Wherein I share stills from (oftentimes unwatchable) movies, miniseries and TV shows displaying hilarious, dubious or questionable crochet tendencies. Ooooh… no thanks. 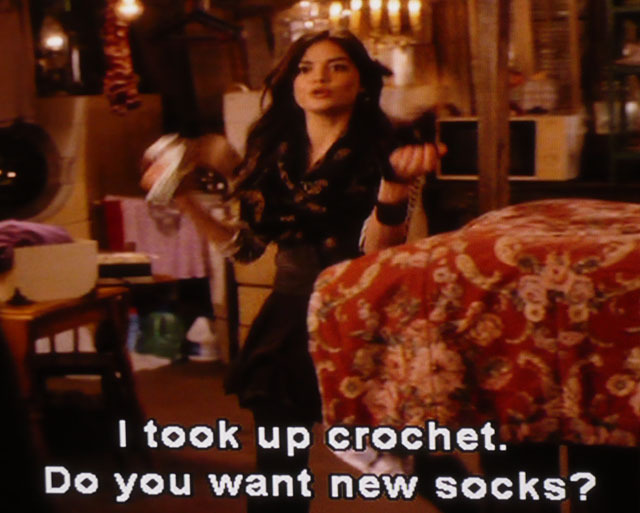 Socks crocheted by Lucy Hale sound about as appetizing as a macrame bra made by Selena Gomez. This entry was posted on January 23, 2013 by croshame. It was filed under Croshame, Hookin' At the Movies, Movie Still Monday .